Stock photo of the snow covered Mount Tantalus (2603 metres/8540 feet), Tantalus Mountain Range, Coast Mountains, British Columbia, Canada. The awesome view of the snow covered Mount Tantalus and evergreens in the Tantalus Mountain Range. 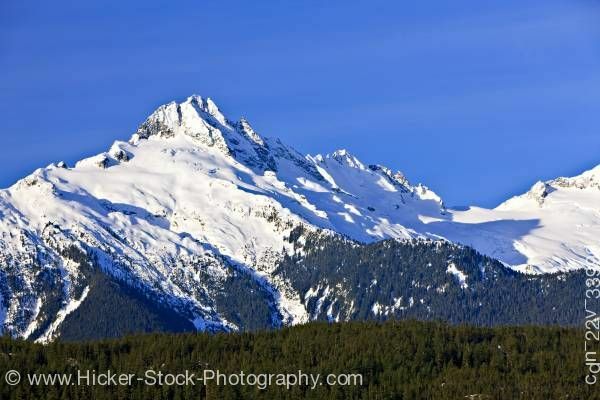 This stock photo shows this awesome sight of the grand Mount Tantalus (2603 metres/8540 feet), Tantalus Mountain Range, the Coast Mountains, British Columbia, Canada. This magnificent view of the snow covered Mount Tantalus is a breath taking backdrop to the abundant evergreen trees. The beautiful crisp white snow covers the mountain in a wonderful white blanket. Part of the mountain’s jagged peaks can be seen without the covering of snow. The expanse of the wonderfully dark green trees dominates the foreground as they make their way up part of the mountain side. The sunny clear day with the beautiful blue sky forms shadows from the mountain peaks that fall on the white snow. Mount Tantalus (2603 metres/8540 feet), Tantalus Mountain Range, Coast Mountains, British Columbia, Canada.